I was thinking that I was finished with my series of Pacific Ocean sunsets, but since there have been requests, I decided to do one more. This is such a peaceful scene to paint and a fun one too. 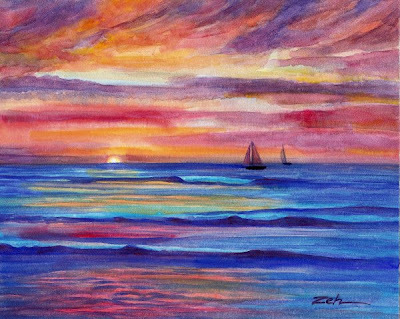 Watercolors are just the medium for both sky and water as they blend readily. Glazing the transparent colors over each other gives a glow to the painting, allowing the sunset colors to permeate almost every part of the scene. Wouldn't you just love to be standing there hearing the wash of the waves onto the shore and watching that sun sink below the horizon?